We’re back to toilets again folks. Just when I’d gotten Darth Vader out of my mind I receive an email from one very dear Italian man, my Italian-Connection-Cousin Paolo…henceforth known as Big Mac. Yes, he’s a beloved member of my Italian family and arguably, he should be nick-named Uomo di montagna…Mountain Man….or some clever variation on that theme because of his love of hiking and climbing mountains big and small. In fact–most likely unbeknownst to him–it was this man who planted the seeds for my love of hiking. I’ll always treasure my first true mountain hike at fifteen in the Dolomite’s, a spectacularly beautiful mountain range in Northern Italy. My three Italian cousins made sure I had proper boots for the hike as well as a jacket and away we went. I recall that it was a warm spring morning with pretty little mountain flowers peeking through moss-covered rocks and lush green grass. It was warm enough that I didn’t know why I’d possibly need a jacket. It didn’t take long to see why. As we climbed it got cooler and cooler. I’ll always remember reaching the snow-covered summit and the tiny “hut” where we would lunch. I wish I could remember the name of the place. What I do recall was that I had the best bowl of pasta in my life in this cozy, rustic jewel of a mountain cabin. There was a welcoming fire in a large stone fireplace that warmed the entire cabin as well as my cold hands and feet. I also enjoyed a few sips of a robust glass of red wine with my meal that made my lips purple after the first sip. Ahhh….I am already transported back in time to a most lovely and cherished memory and for just a few moments I’d like to stay there…. It’s my Italian cousin’s fondness of the Golden Arches of McDonald’s cuisine that struck a cord in my head some years ago after his visit to the U.S. He actually likes Big Mac’s?” I remember thinking at the time. Certainly, I thought it most curious coming from a man who lives in a country with the most fabulous food on the planet! Not to mention his own wonderful culinary skills. And, since I had worked at McDonald’s a lifetime ago to get myself through college I had naturally developed a certain repulsion for the burger. Most likely he was joking, I imagined (he just had to be, right?) but if not…well… it’s a fitting moniker for him all the same if for nothing else that it popped into my head in an instant. Sometimes, you just have to go with what pops in your head in an instant and not over-think things! Big Mac sends me an email with a lovely photo of a gabinetto rustico (literal translation: Rustic Cabinet). Essentially, it’s an outhouse and a very rustic one indeed! 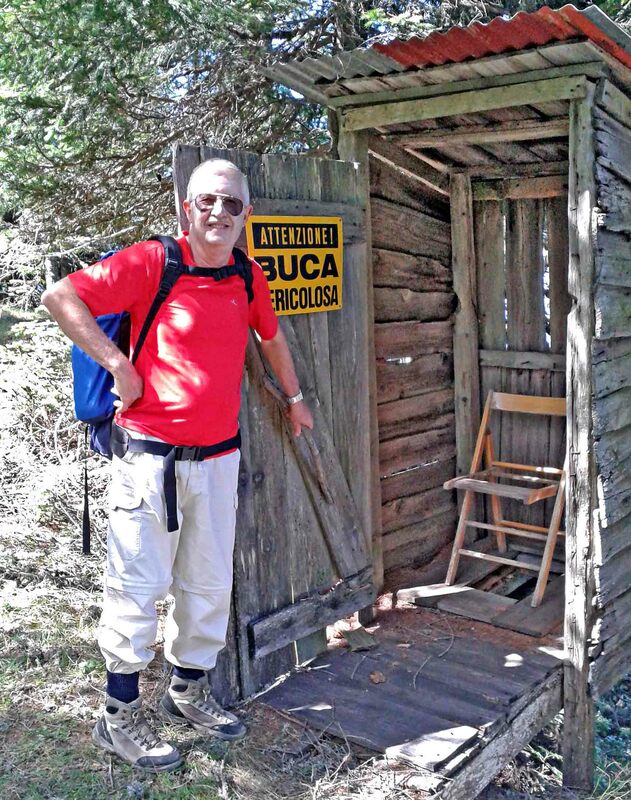 Posted on the door of the outhouse is a sign that reads Attenzione: Buca Pericolosa (Attention: Dangerous Hole). I’m having my first good laugh of the day (Mille Grazie,Big Mac!). It was just what I needed after another sleepless night fraught with worry about a host of things, most of which I have no control over. “Oh absolutely,” came the sunny reply. “It’s just up there around those trees.” Hmm…did I detect a suppressed laugh in Rocket-man’s voice? I made my way in the direction of the bathroom and once there I stopped dead in my tracks. It was nothing more than a shack, much like the gabinetto rustico pictured with Big Mac. There were about six wooded steps up to the outhouse door. No lights or electricity either….no…of course not. And just when I was gathering the nerve to sit on the pot, I see that there are several lizards bathing in the warmth of the late afternoon sun…on the seat. Really?! This was not going to sit well with me if you know what I mean. And yet, I knew that I’d be at this campground for three LONG days. I couldn’t possibly “hold it” for three LONG days. I’ll confess to being quite anxious about the whole thing and had half a mind to climb back up the mountain…back to civilization. Theodore Roosevelt’s axiom for diplomacy, “Speak softly and carry a big stick.” thankfully worked wonders in this situation.